During the second week of January 2015, I received an email from one of our rescue friends –Amy- who seems to attract beagles. Amy loves beagles. Anyhow, this time was no different. She volunteers at a shelter and of course - there was a beagle. She was named Marnie. The call came, the picture was sent, and I said yes, take her to the vet. The vet took x-rays to see what was going on with her. 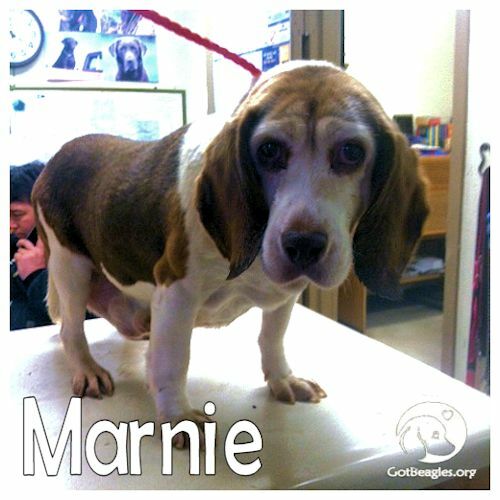 Unfortunately Marnie was diagnosed with tumors along the mammary chain and there wasn't anything that could be done, except to let her go. Marnie was in pain and it could only be managed to a point, but no curing her. There was also an issue in her neck that prevented her from picking her head up all the way. The vet said most likely tumors, from where she had been tied out. We did what we could to save her and we were certainly not expecting this outcome. Marnie was in the company of Amy when she crossed the Rainbow Bridge. She honored her as if she was one of her own and was there for her in her final moments. Please hug your beloved pets in memory of Marnie tonight. And please… make sure their vetting is up to date. You could be saving their lives.